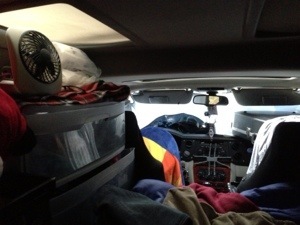 When I crawled into the back of my Jeep last night to go to sleep, I noticed a brightish light shining though the skylight of a Class C motorhome a few spaces away. For a split second I was jealous. Those people had enough head space to stand up! They were giving something up too, though. Agility, for one thing. I can take this Jeep on the back roads…when there are back roads to take. I don’t have as much to pack and unpack. The down side, of course is that I can’t take as much with me. I don’t spend as much on gas as an RV owner, although I’m not so sure it’s close with this 5.7L Hemi. 🙂 I don’t have a place to cook inside, but I get a kick out of forcing a meal from a Sterno can on a picnic table. Thanks to the web and Netflix, I can enjoy movies just like the other half does. And when I sit close to the screen of my iPad, it just as well be a big screen TV! Sometimes, truth be known, I feel a little schizophrenic about it. Part of me loves this Jeep no matter what sacrifices I have to make. I’ve wanted this thing since I was sixteen. But the 54-year-old I’m-done-messin-around part of me likes the idea of camping in luxury with granite-like countertops (not as hefty as the real ones, to save on towing weight and gas) and an onboard toilet with nothing but my own germs on the seat. That’s the kind of thought that goes through a potential future buyer’s mind that become the embryo of a sale. The desire to be able to stand up this one night will grow. It will join with a thousand other moments when I realize what I could gain with an RV. 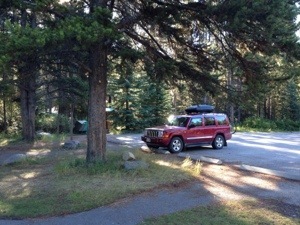 Eventually, as those thoughts grow, the pros of owning an RV will overpower the pros of camping in my Jeep. You probably won’t see me giving up the Jeep, but you might see an RV parked in my back alley. The job of the seller, then, is to understand those moments, and find ways to stay in front of the potential buyer–to commiserate with them on the pros and cons, to tap into the emotion of desire. I guess the clincher for now is that I don’t have the bucks for an RV, but I know there are great places to buy them and get good deals when I’m ready. One of my possible new clients actually sells used ones online, helping match every buyer with just the right seller. See www.classyrv.com–tell your friends who own RVs! For sellers, placing an RV or travel trailer with an online marketer has a lot of benefits. For example, where else can you get that huge a pool of prospects? My client does a ton of marketing. In fact, they cross-market units on eBay, where they run the web’s largest online recreational vehicle outlet! With online exposure like this, you are likely to find the person who is looking for the exact unit you are selling. For another thing, it’s really appealing to let the experts do all the work of getting people in to see the RV. All you have to do is show it. Much less hassle and worry. I’m perfectly happy in my Jeep for now, but when those RVers flaunt their features, I can’t help but dream. One of these days…and then, classyrv.com, if they do a good job of staying in front of me and joining in the fun of my agonizing over the pros and cons, will gain a return on their investment.